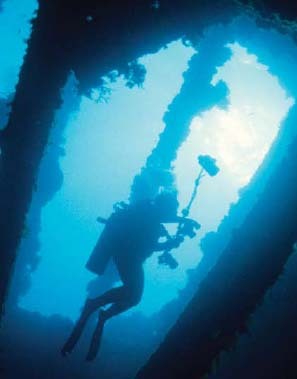 Wreck diving can be enjoyed in a number of locations. But for pure unadulterated variety, sheer numbers and overall dive conditions, no place else on earth can rival Truk Lagoon, located just above the equator in the far western pacific region know as Micronesia. In February 1944 the Allied forces caught most of the Japanese merchant fleet and a few warships with their collective pants down in the atoll's anchorage and sent them to the bottom in a savage air attack. Yeah, pay-backs are hell. My first trip to Truk was in 1974 and only a handful of divers had discovered this tiny paradise that had just begun peeking its head into tourism. Back then only Kimiuo Aisek was seriously gearing up for visiting sport divers. Kimeo had witnessed the attack as a teenager and knew more or less where all the wrecks had settled. He was busy locating the hulks and guiding the occasional visitor with a dive bag to wreck nirvana. Outnumbering the divers then were a rather severe force of missionaries from the U.S. who had been called by a higher authority to save the Micronesians from their wicked ways. The Trukese were an affable sort who lived simply on the primary islands of the atoll and got by on fishing and copra crops all the while eschewing traditional western clothing and morality. This, of course, did not sit well with no nonsense decorum promulgated by the earnest Yankee Protestants with names like Caleb, Enoch and Mordecai. The vision of these determined stalwarts dressed in long trousers, long sleeved shirts and ties was a surreal contrast to men in loin cloths and their nubile ladies wearing mostly a smile and a flower... maybe. Sadly, at least from my perspective, the missionaries prevailed and the natives were converted to a more proper lifestyle. Now the uniform of the day showcases fashion statements ranging from billowing muumuu dresses to tee shirts and Nikes. Ah well, progress. But underwater the wrecks just continue to get better. 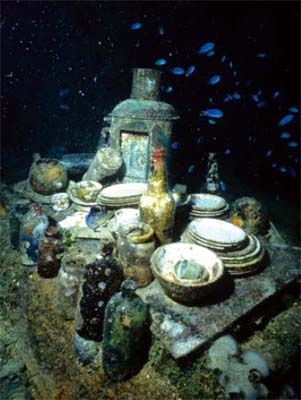 There are over fifty regularly dived ships up to 600 feet in length. Depths vary from barely submerged superstructures on some vessels that sunk in the shallows to deeper sites at 165 feet or more. Aside from the obvious bomb or torpedo damage, these ships are intact and extremely well preserved. Now protected from artifact hunters and other looting, the sunken fleet has become a monument to another era. Visibility ranges from 50 feet to nearly 200 feet and the water temperature averages a toasty 82 degrees. Some sites are less than 20 minutes ride from the main island of Moen. And for liveaboard divers, it's simply a matter of falling off the back of the platform. Festooned with fifty some years of colorful soft corals and other marine life, the ships are alive again with life in their slumber. And you'll probably have no more than ten to twelve divers sharing the wreck with you at any time. 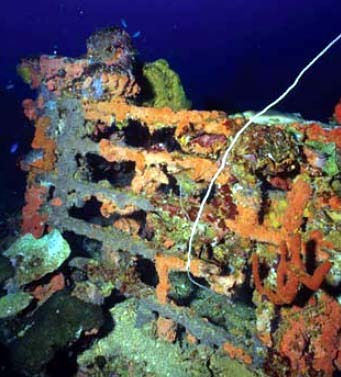 Topping the headliner list of popular sites are the freighters Fujikawa and Nippo who sit upright on the bottom and can be explored without venturing below 130 ft. On the Nippo ,towering crosstree masts reach toward the surface from main decks where troop trucks and tanks are still parked. A meandering swim through the wheel house reveals both the ship's wheel station and engine room telegraph still standing. The indicator is set to "one third ahead" as the captain desperately maneuvered to clear his anchor and steam to safety. The impressive bow and stern guns are aimed skyward in mute defiance. On the Fujikawa, the officer's tiled baths remain intact along with remnants of newspapers impossibly preserved after over half a century submerged. 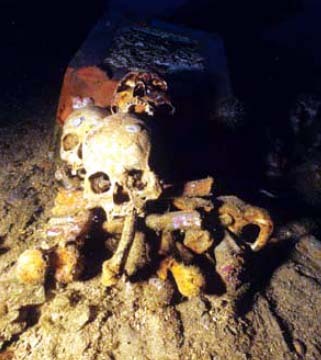 On other ships huge caches of munitions and other ordnance still rest in cargo holds guarded by the skeletal remains of the crew. It's an awesome and sobering vista of a time long gone by. Delicate china tea settings with intricate floral patterns rest incongruously next to machine gun stations with bandoleers of ammunition. Life boats, never launched, hang suspended in davits overgrown with spectacular pink soft corals. Folks, it just doesn't get any better than this. If you're serious about wrecks, this is the place. And the scenery ain't bad either. I recommend the three liveaboard vessels to maximize diving opportunities. So put away the dry suit, forget about a ten hour boat ride in rough seas, and pamper yourself with wreck diving the way it should be. Laid back, easy and with enough high voltage sites to enthrall the most jaded diver. Before you go, take the time to read up on the history of the battle and the accounts of the famed Micronesian star navigators who ventured all over the Pacific in their canoes without charts or compasses. Bret Gilliam has been involved in dive expeditions to the far Pacific since the early 1970's and is known to occasionally wear grass skirts and drink potent native elixirs in the pursuit of a story.